TSPSC ANM/ MPHA (F) Recruitment 2018 - 152 ANM/ MPHA (F) Posts in TVVP |Telangana TSPSC Recruitment 2018-19 Notification for 152 ANM/MPHA Jobs in TVVP – Apply Now | www.tspsc.gov.in | TSPSC ANM Recruitment Notification Qualifications Vacancies Exam Pattern Selection Procedure - Apply Online | Telangana PSC MPHA Recruitment 2018 | Online Apply 158 Latest TSPSC Asst Librarian jobs, Syllabus, Results @ tspsc.gov.in | tspsc-anm-mpha-recruitment-notification-educational-qualifications-exam-pattern-vacancy-details-tspsc.gov.in-apply-online-results-download. 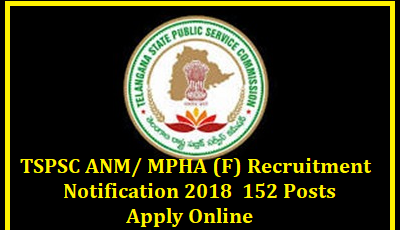 152 ANM/ MPHA (F) Posts in TVVP: Telangana State Public Service Commission (TSPSC), Hyderabad issued TSPSC ANM/ MPHA (F) Recruitment 2018 Notification (Advt. No. 05/2018) for the recruitment of 152 Auxiliary Nurse Midwife (ANM)/ Multi Purpose Health Assistant (MPHA) Female posts in Telangana Vaidya Vidhana Parishad (TVVP), Telangana State. Eligible candidates can apply online through tspsc.gov.in from 29.01.2018 to 28.02.2018.